As the senior officer left in the Colonel Todd command, Daniel Boone made a report of the battle of Blue Licks to Governor Benjamin Harrison of Virginia. Kentucky was still a part of Virginia. Governor Benjamin Harrison, signer of the Declaration of Independence, and president of the Board of War in the Continental Congress during the Revolution, had a boy, William Henry Harrison. At the time of the battle of the Blue Licks young William Henry was nine and a half years old, and going to school. He grew up to be a soldier. He was destined to deal the finishing blows upon the Indians of the Ohio Country. Now although the Shawnees, Mingos, Miamis and all gave up hope of keeping any hunting grounds south of the Ohio River, they tried to keep their lands north of it. The terms of peace between the United States and Great Britain dragged disputes with them. Until these disputes were settled the British held to their posts along the Great Lakes. This encouraged the Indians. Little Turtle of the Miamis arose as a leader of the combined Ohio Country tribes. As related in "Boys' Book of Indian Warriors" he twice drove the United States troops out of the northern region; but upon August 20, 1794, twelve years almost to a day after the battle of the Blue Licks, General "Mad" Anthony Wayne struck him and defeated him in the Battle of Fallen Timbers, near present Toledo, northwestern Ohio. In the army of General "Mad" Anthony Wayne, William Henry Harrison, aged twenty-one, was a lieutenant of the First Infantry—or First Sub-legion, whose trimmings were white. He had been in the Regular army three years, and he had made good. He seemed to have a military mind; had studied hard, and it was his plan of march that was adopted by the council of officers. When traveling through the forest in the Indian country, the foot soldiers were divided into two single files, one upon either side of the trail. The horsemen rode in front and behind and upon the flanks. In this way General Wayne moved without being ambushed. The Indians of the Ohio Valley lost large tracts of their lands. The fighting appeared to be at an end. Lieutenant Harrison resigned from the army in 1798. At the age of twenty-seven, or in 1800, he was appointed Indian Commissioner, and governor of the new Indiana Territory. His capital was Vincennes, on the lower Wabash River in south-western Indiana. The Shawnees occupied villages in western Ohio and eastern Indiana, where the Miamis had formerly lived. Two twin brothers led their councils. These were La-la-we-thika or Loud Voice, and Tecumseh—Crouching Panther or Shooting Star. Governor Harrison and Tecumseh had fought against one another at Fallen Timbers, when both were lieutenants. Soon, now, the Shawnees of the two brothers began to threaten the peace. Loud Voice took the name of Open Door. He pretended to see visions, in which the Great Spirit spoke to him. He prophesied that if the Indians of America listened to him and obeyed his teachings they all would get free of the white man. Tecumseh aided him. The Prophet (as he was called) journeyed far and wide, from Canada to Florida. He sent his runners, bearing a sacred image and the words of the Great Spirit, even to the tribes of the upper Missouri River in the western plains. Tecumseh also journeyed. The Prophet urged the Indians to grow strong and to sell no more lands; and one day the white race should die by a pestilence. Tecumseh urged them to make ready, and to strike all together, at a sign from him. Things pointed to a general uprising of the Indians. Governor Harrison tried in vain to make the Prophet and Tecumseh quit their foolishness. The state of affairs continued for six years. The Prophet moved his town from Greenville in western Ohio to the mouth of Tippecanoe Creek in western north Indiana, near present Lafayette. Shawnees from other towns, Miamis, Kickapoos, Winnebagos, Potawatomis, Chippewas, Sacs, Foxes, and delegates from a farther distance gathered there. In their travel back and forth the Indians stole horses, killed cows and pigs, robbed hen roosts, and frightened the timid settlers. More trouble with Great Britain loomed—the War of 1812 was drawing near; and the white people of southern Ohio and Indiana felt very uneasy. The Prophet and his followers had no right to the land upon which they were squatting. It had been sold by the Miamis and the Delawares to the United States. Governor Harrison, as Indian Commissioner, ordered them off. They would not obey. The Prophet was for peace, but he said that no tribe of Indians should sell any lands without the consent of all the tribes. Tecumseh was for war. At last, in a council held with Governor Harrison at Vincennes he defied the government of the Seventeen Fires to take the land. If the land was taken, then he and his Indians would go to the British in Canada. The council broke up angrily. How many Indians were being mustered by the Prophet and Tecumseh nobody knew. Nevertheless the tribes of north, south and west were being leagued together, war with Great Britain loomed nearer, the future looked very red, the Ohio Valley seemed in danger of rifle and tomahawk again. The year was 1811; many a man still living remembered the bloody days of Kentucky and West Virginia. Vincennes itself feared an attack by eight hundred, one thousand (maybe more) warriors. Tecumseh set out upon another trip, into the south. The Prophet stayed at his Prophet's Town upon the Tippecanoe, one hundred and fifty miles to the north. Governor Harrison resolved to go and see him; build a fort, and if necessary break up the town. "The bandits under the Prophet are to be attacked and vanquished," were the instructions of the Secretary of War to Governor and Commissioner Harrison, "provided such a measure shall be absolutely necessary." The plan for building one or more forts was approved. The Secretary of War directed Colonel John P. Boyd of the Fourth United States Infantry at Pittsburg to report to Governor Harrison, for service. The Fourth Infantry numbered only two hundred and fifty men. It brought Captain Moses Whitney's company of United States Rifles; one company of the Seventh Infantry also joined. There were about three hundred Regulars in all. The Indiana militia were summoned to rendezvous at Vincennes. They had been well drilled; were almost equal to the Regulars. Among them was Captain Spier Spencer's company of Mounted Rifles, who wore short jackets of bright yellow and were called "Spencer's Yellow-Jackets." There were three companies of Indiana dragoons, commanded by Major Joseph Hamilton Daviess, who had volunteered for the campaign. He was district attorney of Kentucky, always signed himself "Jo: Daviess," and loved to be talked about. But no one could question his bravery. Young George Croghan of Louisville, Kentucky, likewise volunteered, to become aide-de-camp to Colonel Boyd. The famous old hero General George Rogers Clark of Louisville was his uncle. He, too, won great fame as a soldier: gallantly stood off an overwhelming force of British and Indians in the War of 1812, and served under General Zachary Taylor in the Mexican War. Colonel Abraham Owen, commanding the Eighteenth Kentucky, was another volunteer, as a private. Governor Harrison promptly appointed him aide-de-camp. Kentucky's veteran Indian fighter Major-General Samuel Wells of the Fourth Kentucky Regiment arrived with two companies of Kentucky Mounted Riflemen. There was a company of volunteer spies. Altogether, Governor Harrison had nine hundred and fifty officers and men. The last week in September they were started from Vincennes up the Wabash River, by boat and by horses. Sixty miles from Vincennes a fort was built, just above present Terre Haute, Indiana, to protect the supplies. The stockade was named Fort Harrison. "We talked with the Prophet. He has raised the tomahawk against the Americans. When we refused to join him he treated us meanly. He is dancing the war dance every night. He will burn the first prisoners that he takes." This frightened the Indian interpreters. They declined to go on in advance with request for a council. But twenty-four Miamis agreed to do it. They were to tell the Prophet that he must send the Winnebagos, Potawatomis, Kickapoos and all outsiders back home; he must give up the horses stolen from the white people; the Indians who had killed white people should be surrendered. The Miamis left. They did not return. It looked as though they also had enlisted under the Prophet. On October 28 Governor Harrison moved out of Fort Harrison, against the Prophet's Town, ninety miles up the Wabash. Lieutenant-Colonel James Miller and fifty sick soldiers remained in the post. Governor Harrison was wise. He took no chances of ambush. He knew Indians, although he did not know how many warriors the Prophet had. Rumors said six hundred, eight hundred, one thousand; and the allied tribes were ready to rise. As likely as not, six thousand warriors awaited only the signal. Using his favorite order of march, he advanced with his infantry, cavalry and wagons. Beyond Fort Harrison northern Indiana and Illinois on the west were red country. Few whites lived here. It was a wilderness of forest and prairie. The shortest trail to the Prophet's Town lay on the east and southeast of the beautiful Wabash, and cut across the inside of the great bend made by the river into the northeast. But that trail led through thick timber. The spies of the Prophet would be watching, and planning ambush. Governor Harrison reconnoitered that trail, for a feint; then he took the longer west-side trail through the grove-dotted prairies. The marches were slow and careful, but no hostile signs interrupted. He was eight days in advancing eighty miles; on November 5 the column emerged from a patch of low wooded hills into full view of a great prairie stretching north and west as far as eye could see. Trees lined the streams; deer grazed, turkeys burst from underfoot, wild fowl flew from the creeks and ponds; but no Indian was sighted. This night the column bivouacked within eleven miles of the Prophet's Town. Governor Harrison reformed his next day's march into several short columns, kept closely in touch and prepared to extend instantly into line of battle. Indians were now hovering about. They declined to reply to the hails by the interpreters. The march approached within a mile and a half of the town. Captain Dubois of the Spy company offered to go on up with a white flag and ask for a talk. Very soon he sent back word that the Indians were beckoning him forward but were closing in behind, to surround him. They would not answer him. Governor Harrison decided to camp for the night in the woods here, and seek a council in the morning. While he was placing the camp (but not in a very good spot) Major Jo: Daviess rode back from a scout with his dragoons. He said that the ground at the river near the town was flat and open, and that the Indians had hooted him—had dared him to come on. Governor Harrison's officers begged him to accept the dare and to camp at the river. Better a battle than a show of the white feather. So in order of battle the little army gladly moved on again, eastward up the river for the ground that the dashing Major Jo: Daviess had selected. The Prophet did not like this. He sent three Indians to say that he was surprised to see his friend Governor Harrison marching to attack; already their good friend Chief Winemac of the Potawatomis was on his way with the Miamis, by the short east side trail, to talk with the governor. "Tell the Prophet that I am not coming to attack his town without warning," Governor Harrison directed. "I will camp at the river where there is wood and water, and hold council with him in the morning." In a short distance the way to the river was shut off by cornfields. While the governor was trying to avoid these, the Indians commenced to threaten in earnest. They called upon the right flank of the line, which was in a cornfield, to halt. 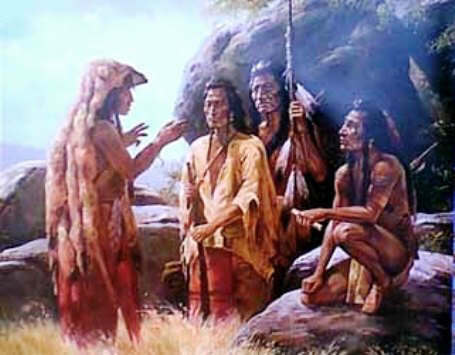 An Indian offered to show the governor a good camp spot, with wood and water, near a creek in the northwest, back from the river and to the rear of the town. The two officers sent to examine the place reported that it would do nicely. They all went over. The camp ground recommended by the Prophet's Indian proved to be a tongue of high and dry oak land—a pointed island in the midst of the marshy, long-grassed prairie. The tongue flowed down from the north, and pinched out in the south. It was from ten to twenty feet above the prairie. The low or eastern side fronted the Prophet's Town, about a quarter of a mile in the northeast, at Tippecanoe Creek; the high western side skirted another creek, bordered by willows and such brush. Governor Harrison thought that it was indeed an excellent camp ground for white man's country, but not in red man's country. The long grass and the brush surrounding it just suited Indian attack; the marshy prairie would bog his troops. Still, he could not back out. Thereupon he made arrangements for the night. He ordered camp pitched in the narrowing end of the tongue. The camp lines followed the shape of the tongue, here. On the Prophet's Town side, or front, there were four companies; across the broad north end of the camp there were three companies; on the western or creek side there were four companies; in the narrow south end there was one company, Captain Spier Spencer's "Yellow-Jackets." In the center there were the officers' tents and the baggage; at either end, inside, there was the support of the Daviess dragoons and some Mounted Rifles. The camp was in form of a blunt pyramid, its base to the north. The lines were single lines, which were better than double lines in case of Indian attack. Indian attack is not a shock attack, like white soldiers' attack; it is made in loose order. A single rank changes front more quickly than double rank, and manoeuvers faster. Tonight Commander-in-chief Harrison told his officers that the camp lines were battle lines. Each man was expected to sleep with his musket, loaded and bayonet fixed, by his side; when alarm sounded he should spring up and stand in his place. The companies would hold their positions and fight without further instructions. It was a chill, drizzly night. Only the Regulars had tents. The militia and volunteers lay under their blankets, along the rows of oak wood fires, and wrapped their muskets to keep the locks dry. The majority of the men were disappointed; they feared that there would be no fighting, after all. The Kentuckians especially hated to return home without having had a "brush." The experienced scouts said: "You'll have fighting, and to spare." At the Prophet's Town all was excitement. The fierce, warlike Winnebagos declared for battle. Not tonight, though. In the morning the council should be held with the white chief; two Winnebagos proposed to strike him dead, as a signal; then the shooting should open from every side. But during the medicine-making the Prophet announced that by his magic powers one-half the white army was now dead, and the other half was crazy and ready for the hatchet. The warriors believed and prepared. White Loon, Stone Eater, and Winemac the Potawatomi were to lead. In the camp the tired soldiers had heard the sounds of dancing and singing. The night closed down dark and murky. The moon, in its third quarter, rose late, behind clouds. A strong screen of sentries had been posted below the edges of the tongue, and among the oaks across the north end of the camp. The guard detail consisted of one hundred and twenty officers and men. Commander-in-chief Harrison had left nothing undone. He really did not believe that the Prophet would attack; but he still took no chances. During all the march, reveille had been beaten by the drummer orderly an hour before sunrise every morning, and the men had stood in line until broad daylight, guarding against surprise. Governor Harrison had learned this method when a lieutenant under Anthony Wayne. This morning of November 7, at a quarter after four o'clock he had just stepped out of his tent, was pulling on his boots beside his fire, chatting with several officers and about to listen for the drummer's reveille beating up the men, when from the oaks and brush beyond the northwest corner of the camp there pealed a ringing musket shot. It was followed at once by a shout, and by the war-whoops, and by a volley. Corporal Stephen Mars of Kentucky, the farthest outpost on that side, had dimly seen dark figures slinking toward him through the black, wet bushes. He had fired, and had shouted and run—but the Indians were close upon him; had killed him and were charging headlong. The men still asleep scarcely had time for staggering up, into line. The guards dashed wildly in, for shelter. "Injuns! The Injuns! The grass is full of 'em!" The soldiers of the northwest corner, facing the oaks and the creek, fired one volley from muskets loaded with twelve buckshot each. Then they were fighting hand to hand, bayonet and musket stock against knife and hatchet. Captain Barton's company of the Fourth Regulars and Captain Geiger's company of Kentucky Mounted Rifles bore the brunt. The Indians were so desperate that several broke through into the camp. The terrible yelling sounded from everywhere. Governor Harrison sought his horse, a favorite white mare. She had strayed during the night—his black servant was so frightened that he could not tell where he had tied her again. Governor Harrison seized another horse, a bay; and well that he did so. His aide, Colonel Owen, mounted a white horse and was shot dead before he had been in the saddle five minutes. One of the two Winnebagos took him for the governor. Commander-in-chief Harrison galloped hither-thither. He reinforced the shattered northwest corner; he ordered that the smouldering fires be stamped out—they gave marks to the enemy. The attack was spreading rapidly. The Indians manoeuvered and charged by signals of deer-hoof rattles. The whole broad north end of the camp was being enveloped, the yells and rattlings and shooting spread around to the east front, and on to the narrow south end, and thence to the rear in the southwest. Both flanks or ends were being turned. Reinforcements hastened. Governor Harrison, using the best at his disposal, prayed for daylight. If he could hold out until then, he might use the bayonet. But the fighting now was in darkness briefly illumined by the red flashes of the muskets. Only one in twenty of his men had been under fire before; still, they were standing firmly, and their twelve buckshot to a cartridge were doing execution. Yet they were falling. The Indians seemed to know no fear. The Winnebagos encouraged. Great warriors, they of the northern tribes. Somewhere the Prophet's voice shrilled in a wild medicine song that should paralyze the whites, and turn the bullets from the shirts of the red stormers. At the narrow point of the camp the Yellow-Jackets were suffering sorely. The attack appeared to be focused upon them. Captain Spier Spencer had been shot through the head. He cried: "Fight on!" He was shot through both thighs. He cried: "Fight on, men!" He was being lifted up, for first aid, when a ball passed through his heart. His first lieutenant, Richard McMahan, and his second lieutenant, Thomas Berry, were dead. Captain Jacob Warwick, of the Indianans there, had fallen. At the field hospital the surgeon had told him that he could not live. "I shall go back then and fight as long as I am able," Captain Warwick said. And so he did, for he was a large strong man. Captain W. C. Baen of the Regulars had been mortally wounded. There was hard fighting at the north end of the camp, too. The Indians were snugly posted in a clump of oaks. Twice Major Jo: Daviess asked permission to rout them out with his dragoons. "I will give Major Daviess a chance to distinguish himself before the battle is over," Commander-in-chief Harrison replied. "Let him be patient." "Tell Major Daviess he may now use his own discretion." Out charged Major Jo: Daviess, wearing a white blanket-coat, at the head of a small detachment of dragoons. He was shot before he had gone thirty feet beyond the lines; his men. were out-flanked and driven in, bringing him mortally wounded. Captain Josiah Snelling's company of the Fourth Regulars counter-charged and cleaned the oak clump. Commander Harrison was grazed by a ball through his stock or neck piece; another ball struck his saddle and glanced along his thigh; another punctured his hat brim; another wounded his horse. The lines still held. Not an Indian won through after the first surprise. Daylight brightened in a gloomy sky at six o'clock. For almost two hours the fighting had raged without a lapse. Now the tables were turned. Major-General Wells, the Kentucky veteran, led a charge of infantry bayonets and dragoon sabers, from the north end; the Prophet's warriors scurried out of the oaks and brush and into the weeds of the marshes. From the south end the Fourth Infantry companies of Captain Joel Cook and Lieutenant Charles Larabee likewise charged with the bayonet and cleared that flank. The Prophet's warriors saw that the soldiers of the Seventeen Fires of the United States were not paralyzed, nor dead; on the contrary were much alive. They gave up; they fled; the battle of Tippecanoe was over. Governor Harrison had lost one aide-de-camp colonel, one major, three captains, two lieutenants, three noncommissioned officers and fifty-two privates killed or mortally wounded; two lieutenant-colonels, one adjutant, one assistant surgeon, two captains, three lieutenants, fourteen noncommissioned officers, one musi cian and one hundred and two privates, wounded. Total, one hundred and eighty-eight, out of nine hundred. But not a man had been captured; only three bodies had been scalped and two of these scalps had been re-taken. This showed how firmly the lines had held. All the day the soldiers remained hi camp, attending to the wounded, eating horse flesh, and entrenching against another attack. Searching parties found thirty-eight dead Indians, and many signs of desperately wounded. Another attack was not made. The wailing of the squaws in the Prophet's Town ceased. When the dragoons and mounted riflemen rode into it they found it abandoned by everybody except one old man with a broken leg. Having utterly destroyed the Prophet's Town, Governor Harrison on November 9 loaded his wounded into all his wagons, and turned for the long journey back to Vincennes. The battle of Tippecanoe freed the Ohio Valley from fear of an Indian uprising. It was the last effort of the allied tribes to drive out the settlers, just as their forays of 1782 and their success in the fatal battle of the Blue Licks had been their last effort to keep the Ohio River border. After this the Indians lifted the hatchet only in revenge; they knew that they could not regain their lands; the Ohio Country was lost to them. Tippecanoe gave William Henry Harrison a great reputation. He entered the army again, as brigadier general, for the War of 1812. October 5, 1813, he defeated the British and Tecumseh's warriors at the hot battle of the Thames, in Ontario, Canada. Here Tecumseh was killed. Here the allied Indians were finally shattered. But General Harrison lives in history as "Old Tippecanoe." When at the age of sixty-seven, in 1840 he ran for President, the slogan "Tippecanoe and Tyler too" carried the country for him. This story of the Battle of Tippecanoe is featured in the book entitled the Indian History for Young Folks by Edwin L. Sabin and was published by George W. Jacobs and Company in Philadelphia in 1920.